First full-length poetry collection from Matthew Buckley Smith. Winner of the 2011 Able Muse Book Award, selected by Andrew Hudgins. Now available from Able Muse Press, Amazon, Barnes and Noble, Foyles, and other online and offline bookstores worldwide. Matthew Buckley Smith was born in Atlanta, Georgia. 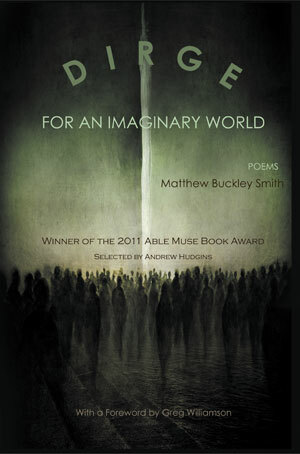 He is the winner of the Able Muse Book Award, 2011, for his Manuscript, Dirge for an Imaginary World, forthcoming from Able Muse Press, Spring 2012. He earned his MFA in poetry at the Johns Hopkins University. His poems have appeared, or will soon appear in various magazines, including Beloit Poetry Journal, Commonweal, Iron Horse Literary Review, Measure, The Alabama Literary Review, Think Journal, and Best American Poetry 2011. His poetry has been nominated for a Pushcart Prize. He lives in Baltimore with his wife, Joanna. Contemporary Poetry Review published my review of Louise Glück, and they even gave it a nice little title.